In the summer of 1969, the United States space agency known as NASA achieved a decade-long goal it had sought: landing a man on the moon and returning him to Earth. Fulfilling a promise laid out by President John F. Kennedy in 1961, Michael Collins, Neil Armstrong, and Buzz Aldrin went to the moon and back. 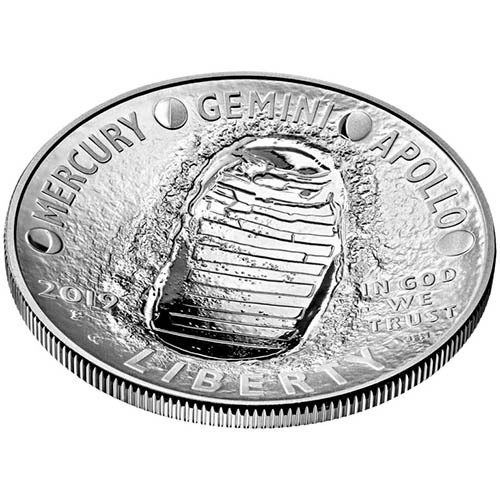 The 2019 $1 American Apollo 11 50th Anniversary Silver Coin is currently available to you for purchase online from JM Bullion. Coins arrive inside of capsules and protective US Mint boxes with a Certificate of Authenticity! Celebrates the 50th anniversary of Apollo 11! Limited mintage in the Apollo 11 Series of just 400,000 silver coins! Contains .8595 Troy oz of .999 pure silver in BU condition. 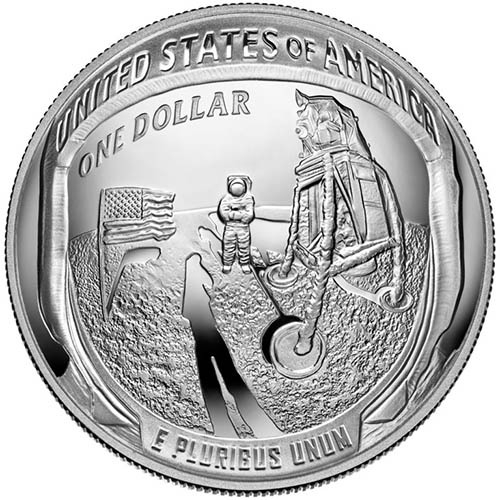 Obverse includes the image of mankinds first footprint on the moon. Reverse offers a depiction of the famous photograph taken close up against Buzz Aldrins visor and helmet. The new Apollo 11 Series of commemorative coins from the United States Mint is available with a limited mintage of 400,000 coins across the silver coin releases. In all, the five-coin issue includes two oz silver coins, a 5 oz silver coin, and two gold coins. Each of the coins comes in a BU option and a collectible proof selection. Apollo 11 was NASAs first manned space mission with the expressed purpose of landing mankind on another celestial body and returning the crew to Earth. The crew of Apollo 11 took off from Merritt Island, Florida, on July 16, 1969. Four days later, the crew approached the moon with Michael Collins piloting the command module as Buzz Aldrin and Neil Armstrong descended to the moon in the Eagle lunar lander. 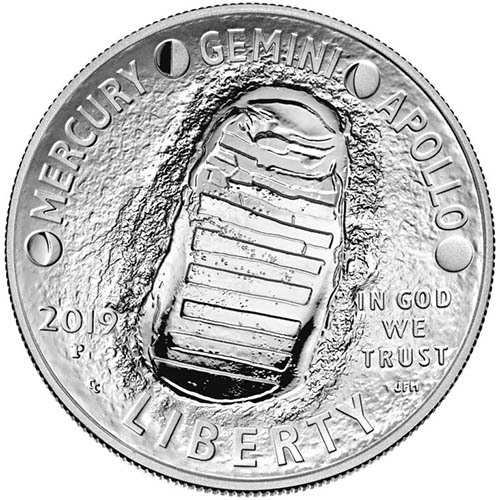 On the obverse of 2019 $1 American Apollo 11 50th Anniversary Silver Coins is the image of an astronauts footprint on the surface of the moon. The engravings around it read Mercury, Gemini, and Apollo. Additional inscriptions include In God We Trust and Liberty, and this side of the coin also bears a P mint mark from the Philadelphia Mint. 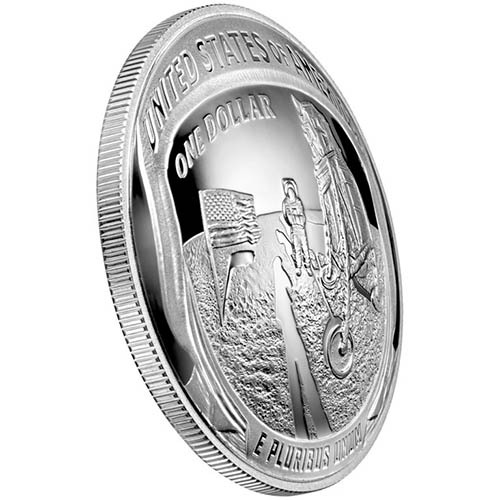 The reverse of 2019 American Apollo 11 50th Anniversary Silver Coins features the famed photograph taken right up against the visor and helmet of Buzz Aldrin, with Neil Armstrong visible in the reflection of his visor. Youll also note the Eagle lunar lander and the United States flag. 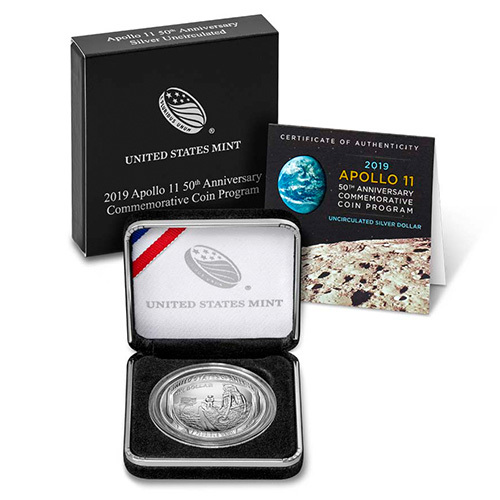 These 2019 $1 American Apollo 11 50th Anniversary Silver Coins are available to you inside of protective capsules and are housed in US Mint commemorative boxes, and are in Brilliant Uncirculated condition. Each coin comes with its own Certificate of Authenticity as well. We encourage JM Bullion customers to call us with questions at 800-276-6508 when buying silver. You can also connect with us online through our live chat and email address features.